It can save you money- Individuals who switch from driving to transit can save an average of more than $10,000 a year on things like fuel, tolls and maintenance. Public transportation helps the environment- Taking public transportation helps keep harmful carbon emissions down by reducing the use of fuel which in turn reduces harmful pollution. In the United States, public transportation reduces fuel consumption by 4.2 billion gallons every year. Public transportation reduces traffic congestion. More people taking public transportation results in fewer vehicles on the road. Fewer vehicles means streamlined routes, faster commutes and even fewer vehicle related accidents! One bus can eliminate the need for around 40 vehicles. Click here to view our system map and route schedules to start planning your day! You spoke, we listened! We've partnered with an internationally-used transportation app to bring quality, real-time bus information right to your phone. And, you can even use the same app in all your favorite big cities too! Download Transit on your iPhone or Android device today! 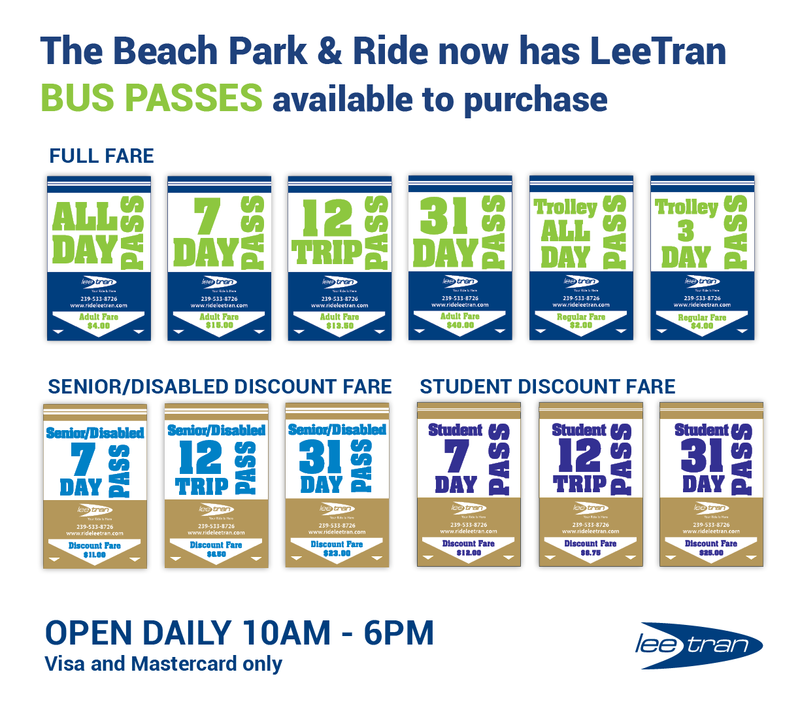 Get Where You're Going With LeeTran! Get a custom map and directions for your next trip on LeeTran by using the Trip Planner. Find out the next arrival time for trolleys on Fort Myers Beach and downtown Fort Myers. If you need additional assistance, please call LeeTran Customer Service at 239-533-8726, option 1. Significant delays expected due to increased beach traffic and ongoing construction on Estero Blvd. Please exercise caution when boarding and alighting the transit vehicles in construction zones. Some stops may not be accessible while crews are working. Stops along US 41 between Victoria Ave. and Winkler Ave. will experience intermittent closures. Stops that are taken out of service will be marked as closed. To use Route 140 please proceed to the nearest stop outside of the construction area. This will impact the 490 Northbound stops on Crescent St., Fifth St., and Times Square. Free open-air tram circling from Bowditch Point Park to Matanzas Pass Preserve. The beach tram is estimated to run every 20 minutes, depending on traffic, seven days a week. Service starts 8 a.m. at Bowditch Park and ends 7:50 p.m. at Matanzas Pass Preserve. Seasonal service runs through May 1. All LeeTran material is available in ADA accessible formats. Please contact LeeTran at 239-533-8726 for assistance.